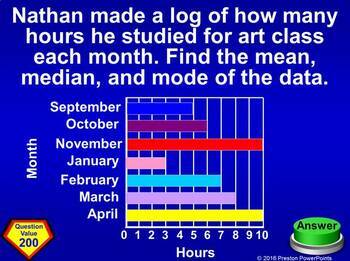 This Quiz Show game, Jeopardy Style, is a great way to review a chapter. There are 25 questions and a scoreboard so you don’t have to write it on a side board. Each page has the point value! NEW: The lesson is in an editable format so you can tailor the lesson to your class. The problems and clipart can’t be edited due to the TOU and to maintain the copyright integrity of the product. You can change the problem number and the names. Using student’s or teacher’s names can be another hook. If you need an alternative version because your country uses different measurements, units, or slight wording adjustment for language differences just email me at PrestonPowerPoints@gmail.com. I am respond to email quickly. 3. Interpret differences in shape, center, and spread in the context of the data sets, accounting for possible effects of extreme data points (outliers). The presentation has 53 slides. Use as many or as few of the problems to help your students learn each concept. 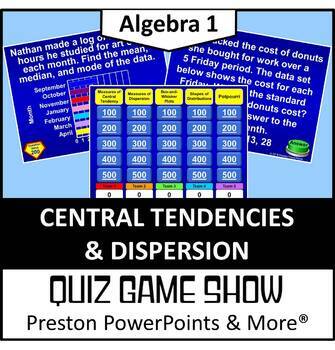 For more PowerPoint lessons & materials visit Preston PowerPoints. 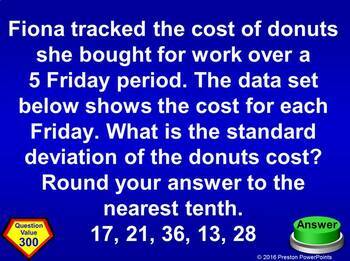 Are you looking for the Algebra 1 Data Analysis and Displays Bundle?Click here! 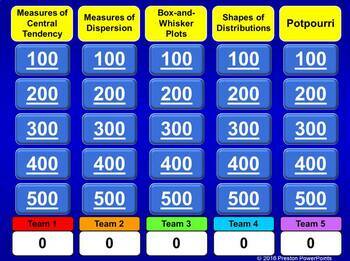 Are you looking for the Algebra 1 Jeopardy Bundle?Click here! This resource is for one teacher only. You may not upload this resource to the internet in any form. Additional teachers must purchase their own license. If you are a coach, principal or district interested in purchasing several licenses, please contact me for a district-wide quote at prestonpowerpoints@gmail.com. This product may not be uploaded to the internet in any form, including classroom/personal websites or network drives.